Pain is a universal experience, so everyone has strong beliefs on the subject. 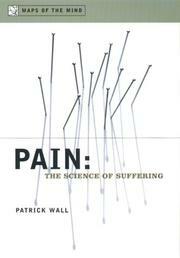 Wall (Defeating Pain, not reviewed) delivers an expert’s account for the general reader. Aside from sensitive areas like politics and religion, most intelligent people enjoy discovering everything they believe is wrong. Wall overturns many popular beliefs, but he plays no favorites, and he insists that the medical profession must also rethink its ideas. We learned in medical school that pain occurs when nerve signals from injured tissue stimulate the pain center in the brain, but this turns out to be wrong. Frequently injured tissue is pain-free, but normal tissue hurts (no one suffering a backache believes his back is healthy, for example, but 85 percent of painful backs show no evidence of injury—and for headaches, this number approaches 100 percent). Yet these victims suffer genuine pain. No study reveals a single pain center in the brain; half-a-dozen areas become active when something hurts (areas that govern attention, orientation, planning for action, and bodily processes such as blood pressure and heart rate), but nothing hurts until the brain gives it a thorough evaluation. After explaining the mechanism of pain, the author turns to its relief, and, again, surprises come thick and fast. Morphine is a natural herbal remedy. Not only is it derived from a plant, but its action mimics a natural narcotic-like substance produced by the brain to modulate pain. The chapter on placebos is an eye-opener: they are, in fact, powerful remedies with significant side effects. Reacting to placebos, therefore, is not a sign that one is suggestible or weak-minded, but rather that one expects a certain outcome. Every human reacts to placebos, as do dogs and rats. Despite his impressive academic qualifications, Wall (Physiology/St. Thomas’s Medical School; Fellow/Royal Society) writes lucidly, using vivid examples, stories from his own life, and a generous dose of personal opinions. Readers may find they know more about pain than those who should be experts—such as their doctors.